We dont talk about us, Our customers speak for us. The Grand Limo App is designed up on continuous feedbacks from the passengers who are riding with us. We tried to make it as easy as possible to make the booking process seamless and transparent. Our courteous drivers, helpful customer care and our wonderful regular happy users of Grand Limo makes us the No.1 in Kuwait. Book your ride through Grandlimo app and you can track driver location, time of arrival and time to destination and the route the driver is taking you through. Rides are billed at 10 minutes intervals other than Airport transfers, billing starts only from the time you board the car. All invoices will be stored in your app for your reference. You can talk anytime before, during or after the trip to the customer service agent using the connect button on the app. We are always here to help you. 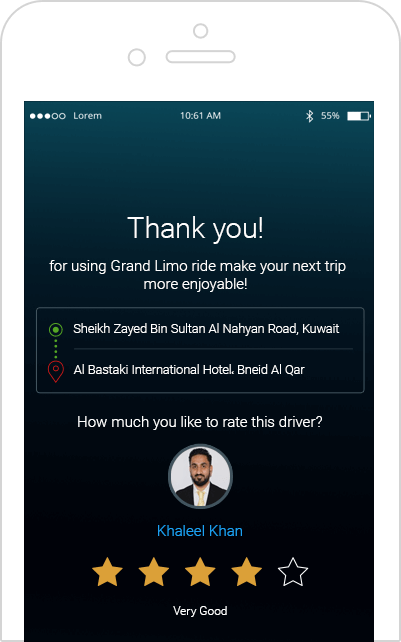 Rate your driver, We value your feedback. We solely depend on our customer feedback to improve our quality of service, every feedback will be carefully counted to serve you better. We make sure our customer environment is clean, safe and fresh at all times. each car cabins goes though natural hypoallergenic disinfectant deodorizing everyday. Cars are service maintained at dealership and wash polished to give our customers sparkling clean and safe rides each and every time. You never talk to an answering machine, All our customer calls are important to us and we are here to help you anytime during booking, trip and even after.